Features the printed engraving of The Great Scarlet Poppy by Wedell, a flower widely recognised as a symbol of Remembrance. Hands remain totally dry. A Joy to Wear! 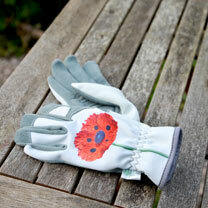 This beautiful RHS Gardening Glove collection is made from an exceptionally soft leather which offers incredible comfort, feel and durability. The padding to the palm has been ergonomically designed to make them incredibly comfortable when using hand tools in the garden.